Gardevoir's official artwork from Pokémon Ruby and Sapphire. Gardevoir (サーナイト, Sirnight) is a creature from the Pokémon series. It appears as a Poké Ball Pokémon in Super Smash Bros. Brawl, Super Smash Bros. 4 and Super Smash Bros. Ultimate. 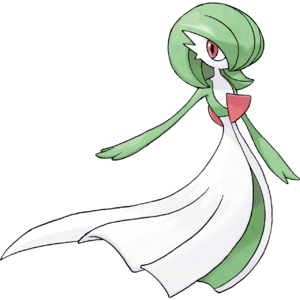 Gardevoir is a Psychic type Pokémon introduced in Generation III, who gained the Fairy type in Generation VI. It is listed in the Pokédex at #282 as the "Embrace Pokémon". Like most Psychic types, it focuses on Special stats. With the introduction of Gallade in Generation IV, Gardevoir is one of two final forms of Ralts, and it can Mega Evolve. It is notably the main Pokémon used by Wally in the original Pokémon Ruby, Sapphire and Emerald and by Diantha in Pokémon X and Y. Reflect is a Psychic-type support move: it creates a barrier which protects the ally team, reducing the damage received from physical attacks for five turns. Gardevoir can learn Reflect with TM33 in every game where both are available. When called from a Poké Ball, Gardevoir encircles itself in a large barrier ("Reflect"), which reflects all opposing projectiles. As the barrier causes no damage in itself, characters are free to continue play within it, though any enemy projectiles used inside will instantly reflect and damage the user. Gardevoir will slowly walk across the stage from end to end for about 15 seconds. Gardevoir's Reflect is the most powerful reflector in the game, doubling a projectile's damage, speed, and knockback. Interestingly, it can't reflect Hotheads, but it can detonate Snake's Down smash. The Gardevoir trophy in Brawl. An Embrace Pokémon. Despite its elegant, feminine appearance, there are both male and female Gardevoir. A Psychic type, it has the ability to predict the future and levitate. It's a brave Pokémon that will risk its own life to protect its Trainer. It uses the ability Synchronize to pass on status problems like poison, paralysis, and burn to its foes. 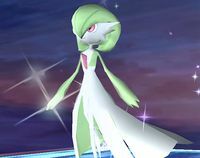 Gardevoir appears in Super Smash Bros. 4 as a Poké Ball Pokémon, retaining its function. Gardevoir is a Psychic/Fairy-type Pokémon, bearing an elegant appearance that male and female Gardevoir share. In Smash Bros., it uses Reflect to turn back projectiles and items launched toward it. Helpfully, it won't affect any of the shots from the player who summoned it. Take advantage of this! This Psychic- and Fairy-type may look like a woman in a long dress, but there are both male and female Gardevoir out there! If you get one in battle, it'll use Reflect, creating a barrier that stops projectiles from hitting you and your allies. It won't block any of your shots, though, so feel free to fire all the projectiles you like! Gardevoir returns as a Poké Ball Pokémon, keeping its previous function. Gardevoir cannot be summoned on Arena Ferox, Magicant, Mute City SNES, Onett, or Wrecking Crew. Artwork of Gardevoir from Ultimate. Magic Coat, which can bounce back some Status moves. Gardevoir can learn it with a move tutor, though only in games released after Brawl. Mirror Coat, which, if the user is hit by a special attack, deals to the attacker double the damage received. However, the user still takes damage, and Gardevoir is unable to learn it. Gardevoir's trophy in SSB4 is a mirrored pose of its official artwork from Pokémon Ruby & Sapphire onward. Gardevoir is among of the few Pokémon that does no damage, and can't be summoned with a Master Ball. Blurb from "Pokémon Encyclopedia" post on Super Smash Bros. DOJO!! This page was last edited on April 6, 2019, at 00:30.